Kate Marvel is Associate Research Scientist at Columbia University and NASA Goddard Institute for Space Science, where she studies climate forcings (things that affect the planet's energy balance) and feedbacks (processes that speed up or slow down warming). She initially trained as a theoretical physicist, and calculated the probability that the Universe could spontaneously decay via quantum tunnelling (low, mercifully). OK, let’s start with some basics. What can we say for sure about anthropogenic climate change, and what can we not say for sure? First, we know that carbon dioxide is a greenhouse gas. We know what its molecular structure looks like, and we know that this structure means that it absorbs infrared radiation. If we’re wrong about this, we’re wrong about the very basics of physics and chemistry. Second, we know that burning fossil fuels increases carbon dioxide in the atmosphere. The chemical reactions that produce energy when we burn oil, gas, or coal inevitably produce CO2 as a byproduct. And that CO2 goes into the atmosphere. We have excellent measurements of atmospheric CO2, and they clearly show a dramatic increase since the industrial revolution. Third, we know the climate has been changing. Multiple independent datasets show the global temperature rising. But that’s not all that’s been happening. There is more water vapour in the atmosphere. Spring is coming earlier. Rainfall patterns are shifting. Glaciers and sea ice are melting. There are more and deadlier heat waves. Fourth, we know that these changes are very, very likely to be due to human activities. We know that the climate changes due to natural factors, but we also have a fairly good understanding of what the climate would look like without us. We can model this natural variability using powerful supercomputers, and we can also study the climate of the past using things like tree rings and ice cores. The changes we’ve observed are too large and too rapid to be attributable to any known natural factors. And they’re very consistent with what we expect increased carbon dioxide to do to the planet. An alternate explanation would have to come up with a plausible natural mechanism for these changes and explain why CO2 doesn’t act the way we think it should – and that’s a very tall order. But we don’t know everything (otherwise my job would be very boring). We don’t know exactly how hot it’s going to get. That’s largely because we don’t know what society will do in the future – will we take action to reduce greenhouse gas emissions, or will it be business as usual? But even leaving aside this uncertainty, there’s still a lot we don’t know about the physical climate system. The planet responds to warming in ways that could either speed up or slow down that warming. A good example is ice melt: the north and south pole are covered in ice right now, and that ice is very good at reflecting sunlight. As the Earth warms, the ice melts, exposing darker ground or water. Without that reflective ice coating more sunlight gets absorbed and the planet gets even warmer, melting even more ice. It’s a vicious cycle, but one we understand fairly well. There are other effects that are much less well understood. For example, we’re pretty sure that global warming will change cloud cover, but we’re not sure exactly how, and we’re not sure if these changes will slow down or speed up the warming. This is an exciting scientific field, and we’re making considerable progress. We also don’t know exactly how climate change will affect specific areas. Policymakers often want information about what to expect and when, and we’ll never have an exact answer. The computer models we use to project the future are improving, but we’ll always have to make decisions in an uncertain environment. In a TED talk earlier this year you stressed the uncertainties relating to how cloud cover will change – that they might help us out with global warming, but they might make it much worse. You also said in that talk that there was no observational evidence that clouds would substantially slow down global warming. Just now you told me that scientists like yourself are making considerable progress on this issue. Does that mean you and others are getting close to a significant reduction in uncertainty here? That’s certainly the hope! Clouds are a real headache for climate scientists because we’re not sure what’s going to happen to them as the planet heats up. And that’s unfortunate, because clouds are incredibly important in regulating the climate. High clouds act a bit like a warm blanket, trapping heat from the planet below. This means that clouds have a very powerful greenhouse effect and make us much warmer. But clouds also play an opposite role. Anyone who’s ever had an outdoor party spoiled by clouds knows that they’re very effective at blocking sunlight. On a global scale, clouds block an enormous amount of sunlight that would otherwise warm the Earth, and so make it much colder. You can see right away how difficult it is to understand what’s going to happen. How will global warming change the greenhouse effect of clouds? Will it cause them to block more or less sunlight? We’re making progress. Unfortunately, it’s mostly bad news. We’re now fairly confident that global warming will make the cloud greenhouse effect more powerful. This will, in turn, cause global warming to get worse. We’re less confident in this, but we have reasons to believe that the future may be sunnier: clouds will block less solar energy. And this also makes global warming worse. There’s still a lot to learn, but I wouldn’t place any bets on clouds saving us from ourselves. 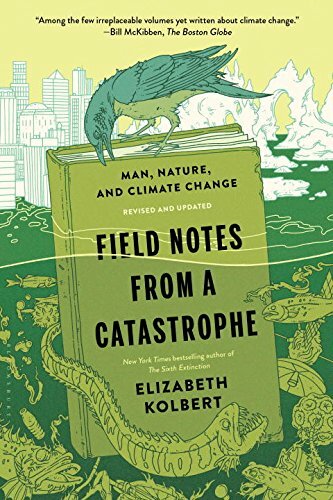 Let’s look at your first book choice, Elizabeth Kolbert’s Field Notes from a Catastrophe (2006). What do you like about this book, and how does it help us think about uncertainty? I have a shocking confession to make: I don’t enjoy reading popular books about climate science. Given what I actually do all day, it all feels a bit too much like hard work. I’d rather read something that entertains me or teaches me something I don’t know already. But I think this book is an important one: it largely gets the science right, and it helps give a sense of the scale of the problem. We see graphs of the planet’s average temperature shooting upward, but that doesn’t mean much, intuitively. No one actually experiences the average temperature, and honestly, in winter a few degrees warming sounds like a great idea. So we’ve developed ways of talking about climate change that I think are ineffective at best. I strongly believe we should impose a temporary moratorium on illustrating stories about global warming with stock pictures of Sad Polar Bears. I mean, polar bears are nice to have around (in theory), but few of us will personally feel their loss. What I like about Kolbert’s book is that it gives glimpses into what climate change actually means. She shows us disappearing villages, extinctions, changes in the migration patterns of animals and diseases and humans, and, in a cautionary scenario, the collapse of entire civilisations. There are layers and layers of uncertainty here: what will the physical climate system do? How will that affect ecosystems and the services they provide? How are we going to react? It’s a bleak book – probably too bleak for my taste – but I think it shows the interconnectedness of climate and ecosystems and society well. 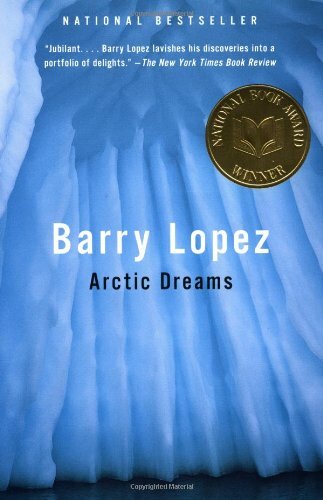 Your second book, Arctic Dreams by Barry Lopez, was published in 1986. Correct me if I’m wrong, but I don’t recall any reference in it to climate change. What can we learn from it? You’re absolutely right that this book doesn’t directly address climate change. That’s one of the things I love about it. We so often hear about the Arctic in the context of threats: it’s disappearing, it’s changing, we’ll never see it again. I think it’s useful, though, to stop thinking of the Arctic only as a symbol of climate change and to remember it’s a real place. If we appreciate the Arctic for itself, maybe that makes it harder to write it off as an inevitable casualty of climate change. I included Arctic Dreams on my list because it’s the only ‘science’ book I’ve read that’s really got close to my experience of doing science. It’s meandering and there’s no real structure; there are seriously pages and pages describing how ice melts in great detail. And then a meditation on musk oxen, and then some more ice melting. It’s all a bit of a mess, but there’s a real sense of wonder and gratitude and beauty that permeate the book. Most science books don’t resonate with my experience because they aim to present the science and explain why we know what we know. And in my own scientific papers, I try to write clear stories: X leads to Y which implies Z. But I feel like scientific papers are a kind of fiction. It’s not that they’re lies, but they’re not exact records of what happened. The real scientific process is more like “I tried X for four months and was confused and gave up, but then I realized that Z and Y were related and read some papers and drank some coffee and finally figured out how X fits in to all this”. There are obvious reasons why research papers and science books don’t exactly reflect this process – they’d all be unreadable and we’d never learn anything. But sometimes it’s nice to read something that evokes how it actually feels to try to find things out. 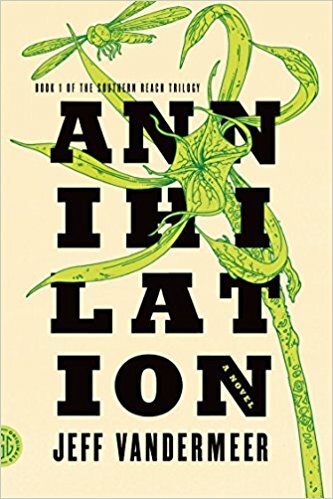 Your next choice, Annihilation by Jeff VanderMeer (2014), could be described in many ways. Among those, perhaps, is that it portrays a world, or a phenomenon that defies normal human understanding. I’m guessing that compared to this book researching climate uncertainty is quite straightforward. I mean, I certainly encounter fewer giant sea monsters in the course of my work. I like this book, and the whole Southern Reach trilogy, because it illustrates that nature is really weird. I feel like there are a few narratives out there: the Dominion story, where we have complete control and mastery over nature, and the Mother Earth story, where nature protects and nurtures us. Neither of these stories is completely false, of course, but it’s useful to be reminded that the planet and its ecosystems don’t necessarily care about our emotional or physical comfort. I mean, I live in New York, a developed city in a rich country, and I have access to roads, a subway system, electric power whenever I want it, and heating or air conditioning. But all that technology is powerless against a blizzard or a hurricane. The whole city can be shut down by weather, and while we can make ourselves more resilient, there’s really nothing we can do to stop a direct hit. I think Annihilation evokes two things very well: that sense of confusion and powerlessness, and the drive to exert some sort of control over the situation by exploring and learning. The typical sci-fi book is set on a distant planet. But we’re ensuring that future generations are going to come of age on a different planet: the one we’re making for them right now. I like that Annihilation is set on a planet that’s very recognizably Earth, but also frighteningly different. We may not all turn into monsters, but I suspect the future might be weirder than we realise. What are some of the ways in which the world might become weirder than many people realise? We’re going to see the emergence of unprecedented climates: conditions that literally no one has ever experienced. And we’ll see more and different extremes. I hate the phrase ‘the new normal’: it’s not like natural disasters will become everyday occurrences. Call it the ‘new abnormal,’ maybe: climate change does mean more heatwaves, more severe downpours, possibly stronger and weirder storms, re-shaping coasts. But here’s the thing that scares me the most: we talk about climate adaptation like our future selves will calmly accept responsibility and make informed decisions to cope with the changing world. History and current events suggest otherwise. Adversity tends to empower demagogues with easy answers, and climate change will bring plenty of adversity. So we should beware ‘climate essentialism’: it’s never just about climate, and you can’t put the vast range of possible human responses in a climate model based on physics and chemistry. The politics of 2016/17 have definitely been bizarre, but I suspect it will only get weirder from here. 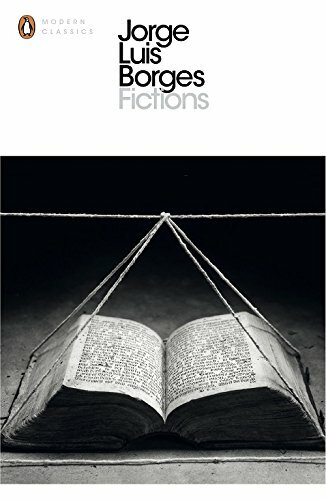 Are there particular stories in your fourth choice, Fictions by Jorge Luis Borges (1944), that speak to you? I don’t think there will ever be a better writer on uncertainty and science than Borges. I’m a huge fan.“On Exactitude in Science”, a story about a map the size of the Empire, is such a wonderful way to think about scientific modelling. Like the British statistician George Box said, “all models are wrong but some are useful”. Scientific models are simplifications of reality. We can make them look more or less like the real world, but we need to be careful that in our drive to create realistic, complex models, we don’t end up with a map of the world the size of the world itself. I also love“The Lottery in Babylon,” about a society where outcomes result from layers and layers of random chance. The rules are clear at first: lottery winners receive money, losers pay out. But the introduction of more rules – more complexity – leads to a world where everything is uncertain and nothing makes sense. You can trace the underlying logic that leads to the randomness. And “The Library of Babylon” has the most accurate description ever of my working life – “As was natural, an inordinate hope was followed by an excessive depression” – and is a beautiful metaphor for discerning pattern within a torrent of random noise. Certain sorts of people are very fond of telling climate scientists that climate has always changed, as if we weren’t the ones who figured that out. And there are some people with an inordinate of power who seem to believe phenomena like ‘winter’ are unknown to science. The signal of climate change – a human fingerprint on temperature, rainfall, cloud cover – is always superposed on a noisy background of natural climate variability. If we never existed, of course the climate would change: the Earth would still go around the sun on a tilted axis; air and water would still slosh back and forth, hurricanes and heat waves would still happen. But – and this is what I love so much about Borges – there is order in randomness. We don’t just throw up our hands when confronted with noise; we can use the tools of statistics to understand it. And what those tools are telling us is that the changes we’ve seen recently are very, very, very unlikely to be due to natural variability alone. 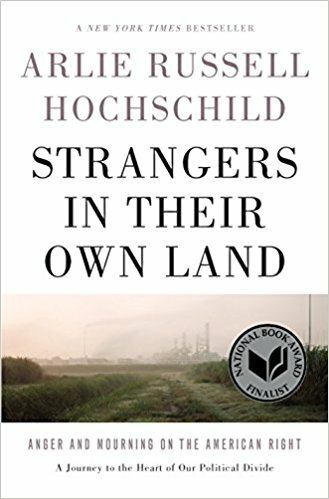 What can your final choice, Arlie Russell Hochschild’s Strangers in Their Own Land (2016), teach us about uncertainty? I like physics and chemistry because no matter how complicated systems get, you can always reduce them to simple laws. I may not know what every air molecule or water droplet in the atmosphere is doing, or how they interact with each other, but in isolation, I know exactly which physical laws they must obey. There is no equivalent for human beings. People act irrationally, they go against their own best interests, they have biases. And, unfortunately, people are the biggest uncertainty in climate change. Will we curb greenhouse gas emissions, or will it be business as usual? Strangers in Their Own Land is a frustrating but important book. Hochschild is a Berkeley sociology professor who leaves her liberal bubble to talk to rural Lousianans. The whole thing is told through the lens of environmental protection: the people of Louisiana have seen the destruction of their beloved hunting, fishing, and swimming grounds. Many of them suffer health effects directly linked to pollution. Yet, their suspicion of government solutions and devotion to conservative principles means they reject any regulation. Hochschild argues that all social groups have a “deep story”: a narrative that makes the complicated world make sense. The only way to talk to each other is to understand and engage with this deep story. So when we talk about climate change, we sometimes assume people will be swayed by one more graph, one more coherent argument. But that’s not how people work. More facts don’t change minds, and deeply held views don’t always dictate behaviour. I know what a column of air does when you heat it up. I have no idea what people do when they get heated up. And that’s the biggest climate uncertainty. Five Books interviews are expensive to produce. If you're enjoying this interview, please support us by donating a small amount, or by buying some of our most recommended books from Amazon. Since we are enrolled in their affiliate program, we receive a small percentage of any product you buy, at no extra cost to you. What Do Climate Change Films Teach Us About Climate Change?